A cost of reproduction in terms of reduced future performance underlies all life-history models, yet costs have been difficult to detect in short-term experiments with long-lived plants. The likelihood of detecting costs should depend on the range of variation in reproductive effort that can be induced, and also on the shape of the cost function across this range, which should be affected by resource availability. Here, we experimentally examined the effects of both reduced and increased fruit production in two populations of the long-lived orchid Gymnadenia conopsea located at sites that differ in length of the growing season. Plants that were prevented from fruiting produced more flowers in the population with a longer growing season, had higher survival in the other population, and grew larger compared to control plants in both populations. Fruit production was pollen-limited in both populations, and increased reproductive investment after supplemental hand-pollination was associated with reduced fecundity the following year. The results demonstrate that the shape of the cost function varies among fitness components, and that costs can be differentially expressed in different populations. They are consistent with the hypothesis that differences in temporal overlap between allocation to reproduction and other functions will induce among-population variation in reproductive costs. Life-history theory assumes a trade-off between current reproduction and future performance, i.e. a cost of reproduction (Stearns 1992). Yet our understanding of how costs of reproduction are expressed in plants and the shape of the cost function for different components of fitness is limited. 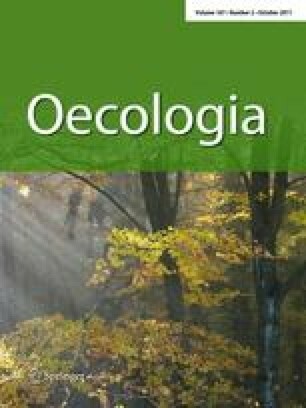 Some empirical studies of plants have confirmed the existence of a cost of reproduction, but there are several exceptions (Obeso 2002). In observational studies, apparent absence of costs may be due to confounding effects of environmental heterogeneity that influence overall resource availability, or failure to consider all traits involved in allocation trade-offs. If variation in overall resource availability is large relative to variation in proportion of resources allocated to reproduction, costs of reproduction can be difficult to detect (van Noordwijk and de Jong 1986; Reznick 1992; King et al. 2010). Moreover, often more than two traits are likely to be involved in allocation trade-offs and negative correlations are not necessarily expected between all pairs of traits (Ågren and Schemske 1993; de Jong 1993). However, experimental studies have also failed to detect costs of reproduction (Obeso 2002; Reekie and Avila-Sakar 2005), and additional information is needed on how estimates of costs depend on experimental approaches, fitness components considered, and environmental conditions. In experimental studies, the likelihood of detecting costs will depend on the range of variation in reproductive effort that can be induced experimentally, and on the shape of the cost–investment relationship across this range (Ågren and Willson 1994; Thompson and Eckert 2004). While several studies have demonstrated significant costs of increased reproductive effort after supplemental hand-pollination in species with low natural seed set (e.g. in deceptive orchids; Primack and Stacy 1998 and references therein), this approach has limited power if seed production is not limited by pollen deposition. Likewise, reduced reproductive effort through flower removal may have little effect in perennial species with low investment in reproduction, explaining the lack of documented effects in several studies (e.g. Fox 1995; Huhta et al. 2009). By including both experimental reduction and increase in reproductive effort in the experimental design, the likelihood of detecting costs of reproduction should increase (e.g. Snow and Whigham 1989; Garcia and Ehrlén 2002). Manipulation of reproductive investment in both directions also allows an assessment of whether the shape of the cost function varies markedly among fitness components, i.e. whether different fitness components are affected by an experimental increase and reduction in reproductive effort, respectively. In several studies, costs of reproduction have been detected only for some of the fitness components considered (Ågren and Willson 1994; Henriksson and Ruohomäki 2000; Ehrlén and van Groenendaal 2001; Aragón et al. 2009). In long-lived species, fitness is expected to be more sensitive to changes in survival than to changes in growth or fecundity (Stearns 1992; Charlesworth 1994; Franco and Silvertown 1997), and reproductive investment should be maintained at a level that ensures high survival. An experimental manipulation of reproductive effort is thus more likely to reveal costs expressed as reduced growth and fecundity than as reduced survival. In accordance with theory, experimental studies of plants have reported negative effects of reproduction on growth and fecundity more frequently than negative effects on survival, but this may also reflect the fact that trade-offs involving survival rarely have been examined (cf. Appendix 1 in Obeso 2002). Estimates of costs of reproduction should vary with environmental conditions. Costs have been predicted to be most evident in habitats with low resource availability or stressful conditions (Reznick 1985), and trade-offs should be strongest between functions that compete for resources at the same time (Bell and Koufopanou 1986). Costs of reproduction are therefore likely to vary with the length of the growing season, because with a shorter growing season the temporal overlap between allocation to current reproduction and allocation to future survival and reproduction should increase. However, few studies have examined costs of reproduction in multiple populations or environments, and available results are mixed. Reproductive costs were reduced at higher temperature in the alpine perennial herb Saxifraga stellaris (Sandvik 2001), but not in Parnassia palustris (Sandvik and Eide 2009). Some studies indicate that costs increase in less productive sites (Biere 1995) or when the resource acquisition capacity of plants is reduced by defoliation (e.g. Lubbers and Lechowicz 1989; Primack and Hall 1990), but in several studies, direct manipulation of resource availability did not result in accentuated costs in low-resource treatments (Cheplick 1995; Saikkonen et al. 1998; Ronsheim and Bever 2000; Thompson and Eckert 2004; but see Primack and Antonovics 1982). In this study, we experimentally reduced and increased fruit production in the long-lived, rewarding orchid Gymnadenia conopsea, using two populations found at sites that differ in length of the growing season. We ask the following questions. (1) Is fruit production associated with reduced flower production in the same year (reflecting a within-year trade-off between fruit and flower production), and reduced survival, size and fecundity in the following year? (2) Do experimental increases and reductions in fruit production affect different components of fitness? (3) Are costs more pronounced at the site with a shorter growing season? Gymnadenia conopsea (L.) R. Br. is a terrestrial orchid, distributed across Eurasia (Hultén and Fries 1986). It occurs on calcareous soils in grazed meadows and margins of marshes and fens. The species is a long-lived perennial (cf. Øien and Moen 2002); 43% of the plants present in a monitoring programme in 1990 were still alive 18 years later (average minimum life-span = 10.4, n = 93; Moen, Øien, Sletvold, unpublished data). The species is tuberous and non-clonal, and characterised by high fruit set (Lönn et al. 2006) and low probability of repeated flowering in subsequent years (Øien and Moen 2002). Individuals emerge aboveground in late May to early June, and flowering starts 3–4 weeks later. Plants produce a single inflorescence with ca. 10–70 nectariferous flowers that open acropetally. Flower primordia are formed in the autumn prior to flowering (N. Sletvold, personal observation), but the proportion of flower primordia developing into functional flowers varies, and is likely to depend on resource availability during the flowering period. G. conopsea is visited by diurnal and nocturnal visitors (Meyer et al. 2007). In the study populations, flower visitors include butterflies, hawkmoths and flies (Sletvold and Ågren 2010). G. conopsea is self-compatible, but depends on flower visitors for pollen transfer (Jersáková et al. 2010; N. Sletvold, unpublished data). Populations flower for about a month, and fruits mature 4–6 weeks after pollination. The two study populations are located 145 km apart in two nature reserves in central Norway, situated at the transition between the middle boreal and north boreal vegetation zones (Moen 1999). The coastal Tågdalen population (63°03′N, 9°05′E) is situated at 450 m a.s.l. and has an oceanic climate (annual precipitation 1,507 mm), while the inland Sølendet population (62°40′N, 11°50′E) is found at 770 m a.s.l. and has a more continental climate (annual precipitation 670 mm). Mean monthly effective temperature sums (ETS; cf. Laaksonen 1979) are similar in the two nature reserves in May–July, but higher at Tågdalen in August–September (Lyngstad 2010; modelled based on data collected at nearby meteorological stations in 1973–2008). The growing season (days between first and last 5-day period after snowmelt with a mean temperature above 5°C) is on average 5.5 days longer in the Tågdalen nature reserve compared to the Sølendet nature reserve (estimates based on data from 1980 to 2007; Lyngstad 2010). However, the actual difference between the two study populations is likely to be considerably larger due to marked differences in local topography. The Tågdalen population is situated on a steep south-facing slope, while the Sølendet population is sloping gently eastward. The shorter growing season in the Sølendet population is likely to increase the temporal overlap between allocation to current reproduction and allocation to survival and future reproduction compared to the Tågdalen population, and reproductive costs should thus be more pronounced at the former site. Both populations are found in open, wet grasslands, dominated by Molinia caerulea (L.) Moench, Succisa pratensis Moench, and Thalictrum alpinum L.. The number of flowering G. conopsea individuals in 2008 and 2009 was approximately 200 and 400 in the Tågdalen population and 600 and 1,000 in the Sølendet population, respectively. In June 2008, a total of 180 and 360 plants were individually marked in the two study populations Tågdalen and Sølendet, respectively. In both populations, one-third of the plants were randomly assigned to each of three treatments, (1) open-pollinated controls, natural level of reproductive allocation, (2) removal of all flowers, reduced reproductive allocation, and (3) supplemental hand-pollination, increased reproductive allocation. To quantify initial plant size, we counted the number of leaves and recorded maximum length and width of the two longest leaves of each plant at the start of the experiment. Populations were visited 1–3 times per week, and in the hand-pollination treatment, all open flowers were pollinated by hand with cross-pollen from the local population. All flowers received supplemental pollination at least once. In the flower-removal treatment, we removed flower buds with scissors as they were about to open, and noted the total number of flowers removed. At the end of flowering, we recorded the total number of flowers and fruits in open- and hand-pollinated plants. In June 2009, we relocated the marked plants and recorded their status (missing, vegetative, or flowering), and size. All missing individuals had an intact tag and were considered dead. We cannot exclude the possibility that some of the missing individuals were dormant rather than dead. However, long-term monitoring of individual plants in the study populations suggests that dormancy is rare (Moen, Øien, Sletvold, unpublished data). The annual rate of plant loss is low (mean = 5.3%, 1996–2006) and no tubers were found in a previous attempt to excavate missing individuals in the Sølendet population (n = 6). We counted the number of leaves and measured maximum length and width of the two longest leaves on each living plant. At the time of fruit maturation, we recorded the total number of flowers and fruits produced by flowering individuals. In both years, we estimated plant size as the product of number of leaves and mean leaf area. To quantify the increase in fruit production following supplemental hand-pollination, we calculated pollen limitation (PL) for each population as 1 − (mean number of fruits produced by open-pollinated control plants/mean number of fruits produced by hand-pollinated plants). We used two-way ANOVA to examine the effects of treatment and population on plant size (total leaf area) and number of flowers and fruits in the first year. To improve normality of residuals, plant size was log-transformed prior to analyses. The flower removal treatment was excluded in the analysis of fruit production. We used linear models including initial plant size (leaf area in the first year) as a covariate to examine effects of population and treatment on plant size and fitness components in the second year. Survival and flowering propensity (flowering vs. non-flowering in the second year) were analysed with binomial errors and a logit link function (proc GENMOD; SAS 9.2; SAS Institute, Cary, NC, USA), while leaf area, and number of flowers and fruits (including only reproductive plants) were analysed with normal errors and identity link (proc GLM). To determine whether the cost of reproduction is size-dependent, we initially included the interaction between treatment and initial size in the statistical models. In the analysis of total leaf area, we initially included also reproductive status in the second year (flowering vs. non-flowering) and its interactions with population and treatment because leaf morphology differs considerably between vegetative and reproductive plants. Because interactions with initial size (all models) and with reproductive status (analysis of leaf area in the second year) were not statistically significant (P > 0.10), they were omitted from the final models. In cases with a significant treatment × population interaction, we proceeded with one-way ANOVA to examine effects of treatment within each study population. There was no mortality in the Tågdalen population, and the analysis of the effects of treatment on survival was therefore confined to the Sølendet population. In cases with a significant treatment effect, we performed post-hoc comparisons using the Tukey’s test in GLM or the LSMEANS and DIFF options in GENMOD. Plants in the Tågdalen population were larger (F 1,520 = 58.3, P < 0.0001) and produced more flowers (Table 1; Fig. 1a) compared to plants in the Sølendet population, but plant size did not differ among treatments at the onset of the experiment (F 2,520 = 1.64, P = 0.20). In both populations, fruit set among open-pollinated control plants was high (73–74%). Fruit production was pollen-limited (significant treatment effect, Table 1; PL = 0.13 at Tågdalen vs. PL = 0.22 at Sølendet), but the flower removal treatment represented a larger change in fruit production than did the supplemental hand-pollination (Fig. 1b). The effect of experimental manipulation of fruit production on the number of flowers produced in the first year differed between the two populations (significant treatment × population interaction; Table 1; Fig. 1a), with significant variation among treatments at Tågdalen (one-way ANOVA; F 2,156 = 3.43, P = 0.035), but not at Sølendet (F 2,349 = 0.23, P = 0.80). In the Tågdalen population, plants that were prevented from fruiting tended to produce more flowers than plants in other treatments (Tukey P < 0.08 for both comparisons; Fig. 1a). Fruit production reduced plant size in the following year in both populations, and survival at Sølendet, the population with a shorter growing season. In the Sølendet population, plants that were prevented from fruiting had significantly higher survival than hand-pollinated plants (Table 1; χ 2 = 9.38, P = 0.0022), and also tended to have higher survival than open-pollinated controls (χ 2 = 3.81, P = 0.051), whereas the difference between controls and hand-pollinated plants was not statistically significant (χ 2 = 1.70, P = 0.19; Fig. 1c). At Tågdalen, all plants were still alive in the second year (Fig. 1c). In both populations, plants that were prevented from fruiting had significantly larger leaf area than plants in the other treatment groups (Fig. 1d; Table 1; Tukey P < 0.0001 for both comparisons), whereas no significant difference was found between controls and hand-pollinated plants (Tukey P = 0.72). Initial size positively affected size in the following year, and the leaf area of reproductive plants was larger than that of vegetative plants (Table 1; mean leaf area ± SD, reproductive vs. vegetative, Tågdalen 36.2 ± 15.4 vs. 27.3 ± 16.0 cm2, Sølendet 25.4 ± 13.0 vs. 17.0 ± 10.5 cm2). Few experimental plants flowered in 2009 (<22% in all treatments), indicating a high cost of flowering. Flowering propensity was significantly lower among hand-pollinated plants compared to both open-pollinated controls (Fig. 1e; Table 1; χ 2 = 7.49, P = 0.0062) and plants that were prevented from fruiting (χ 2 = 6.95, P = 0.0084), but did not differ between the latter two treatments (χ 2 = 0.01, P = 0.93). Flowering propensity increased with initial size (Table 1). Among reproductive plants, flower production did not differ significantly between populations or treatments (Fig. 1f; Table 1), but fruit production was significantly lower among plants that were hand-pollinated in the preceding year compared to plants that were prevented from fruiting in the preceding year (Fig. 1g; Table 1; Tukey P = 0.042). Fruit production of open-pollinated controls did not differ significantly from that of the other treatment groups in the second year (Fig. 1g; Tukey P > 0.30). The orchid G. conopsea has a high fruiting success, and natural levels of fruit production incurred significant costs in terms of reduced flower production in the same year in the population with a longer growing season, reduced survival in the population with a shorter growing season, and reduced plant size in the following year in both populations. In contrast, fecundity costs were detected only after an experimental increase in fruit production, which reduced flowering propensity and fecundity the second year. These differences show that the shape of the cost function across the examined range in reproductive allocation varied among fitness components, and that costs can be expressed through different pathways in different populations and depending on the direction of change in current reproductive investment. Similar results have emerged from studies with birds, where experimental increases and reductions in reproductive effort have shown that the shape of cost functions may depend on the life-history trait considered and may differ between sexes (e.g. Jacobsen et al. 1995; Velando and Alonso-Alvarez 2003). The actual fitness components affected by the different manipulations were partly unanticipated. In G. conopsea, we expected reductions in reproductive effort to affect fecundity more strongly than survival, whereas the opposite was true in one of the study populations. Long-lived species are expected to maintain reproductive allocation within a range which ensures high probability of future survival (Clutton-Brock 1984), and survival may thus not respond readily to experimental manipulation of reproductive effort. Consistent with this prediction, even long-term experimental studies have failed to document survival costs in long-lived plants (Primack and Stacy 1998) and birds (Erikstad et al. 2009). Surprisingly, the present results indicate a significant survival cost of natural levels of fruit production in the Sølendet population of G. conopsea. The decrease in survival probability from 0.95 to 0.82 may seem modest, but the importance of survival for lifetime fitness should be high in long-lived perennials (Franco and Silvertown 1997). Long-term demographic studies suggest that dormancy is rare in the study population (Moen, Øien, Sletvold, unpublished data), but we cannot dismiss the possibility that some of the plants recorded as dead in the present study were actually dormant. This would represent a lower but not insignificant demographic cost of fruit production. Several studies indicate that dormancy per se involves costs (Hutchings 1987; Shefferson et al. 2003). We are presently collecting demographic data to determine whether selection favours reduced reproductive effort in the Sølendet population under current conditions. Costs of reproduction were partly expressed through different fitness components in the two study populations. Among-site differences in the ways costs of reproduction are expressed have previously also been documented in the perennial herbs Primula veris (Syrjänen and Lehtilä 1993) and Ranunculus acris (Hemborg 1998), and the timing of cost expression varied among populations of the orchid Cypripedium acaule (Primack and Stacy 1998). A number of factors may cause among-population variation in cost expression. Costs may be reduced at productive sites (Reznick 1985; Biere 1995; Jacquemyn et al. 2010), or populations may differ in the timing of investment in competing functions (cf. Méndez 1999; Thompson and Eckert 2004), causing variation in the degree of temporal overlap between investments in growth, flowering and the production of storage organs. The Sølendet population is situated at higher altitude than the Tågdalen population, and experiences lower temperatures and a shorter growth period. More restrictive conditions are also indicated by the fact that plants at Sølendet produce fewer flowers and have lower survival compared to plants at Tågdalen. The shorter season should increase the temporal overlap between allocation to reproduction and allocation to storage and winter survival, and could explain why a survival cost was detected only in the Sølendet population, and why flower removal did not result in increased flower production at Sølendet, while it did so at Tågdalen. Numerous studies on birds and mammals have supported the prediction of higher costs of reproduction when conditions are adverse (see references. in Erikstad et al. 2009), but the evidence for this in plants remain unconvincing (Dostal et al. 2009; see “Introduction”). Manipulations of the environment in the two study populations could clarify which factors influence the expression of costs of reproduction in G. conopsea. There are as yet few experimental studies that include multiple populations, and additional work is needed to determine how the shapes of cost functions vary across environments. There is some evidence that costs may be size-dependent (Worley and Harder 1996; Hemborg and Karlsson 1998; Jacquemyn et al. 2010), suggesting that among-population variation in plant size may contribute to differential cost expression. However, in the present study, treatment effects did not vary with initial plant size (no significant interaction between treatment and size), and differences in cost expression between the two populations could not be explained by the difference in mean plant size. We detected significant short-term costs of both natural and increased reproduction in the rewarding G. conopsea. Most previous experimental studies of costs of reproduction in orchids have been conducted on deceptive species, i.e. species which do not offer any reward to their pollinators, and which are characterized by low levels of natural fruit set (Primack and Stacy 1998 and references therein). These studies have consequently only examined costs associated with increased reproduction (but see Snow and Whigham 1989). The present results suggest that natural levels of fruit production are associated with a substantial cost, and also indicate that inflorescence production in itself is costly. Despite a higher number of flowering individuals in both study populations in the second year compared to the first, very few of the experimental plants flowered in the second year, and this was also true for plants that were prevented from producing any fruits in the first year. A significant cost of flower production has been demonstrated experimentally also in the woodland orchid Tipularia discolor (Snow and Whigham 1989). A low probability of repeated flowering in subsequent years has been reported in previous observational studies of G. conopsea (Øien and Moen 2002; Gustafsson 2007), and intermittent flowering is apparently typical for several temperate orchids (Wells and Willems 1991). The present results suggest that such intermittent flowering may be a function of costs associated with both flower and fruit production. A full understanding of life-history evolution requires insights into trade-offs at both the phenotypic and genetic levels (Roff 2000, 2002). Experimental manipulation of reproductive investment to determine phenotypic trade-offs should thus ideally be combined with breeding designs or selection experiments to quantify genetic variances and covariances among life-history traits (Reznick 1985, 1992; Partridge and Harvey 1988). Because of their long juvenile period, and their rather specific demands on growth conditions, the genetic analysis of life-history trade-offs in orchids remains a major challenge. To conclude, this study has demonstrated substantial short-term costs of both natural and increased levels of reproductive effort in the orchid G. conopsea, partly expressed through different paths. However, some costs may become evident only after several episodes of high reproductive investment, and some costs detected in short-term experiments may be insignificant across the entire life history. Demographic data allowing the modelling of cost effects on lifetime fitness will therefore be required for a comprehensive understanding of how current reproduction affects future performance in this and other long-lived perennial plants. This study was financially supported by grants from the Norwegian Research Council to N.S., and from the Swedish Research Council to J.Å. We thank J. M. Grindeland for assistance during field work, and A.A. Winn and two anonymous reviewers for helpful comments on the manuscript. Our work complied with the current laws of Norway.